Are those ducks or geese? Or terrorists? Do your kids have enough firepower at their fingertips? 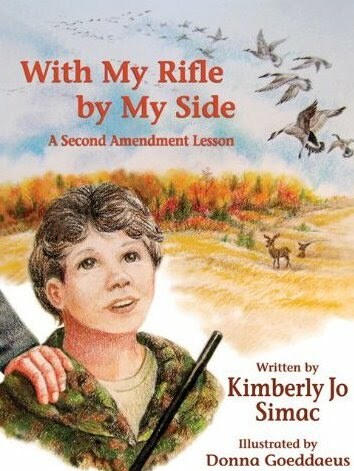 Just out this summer is a children’s book about the 2nd Amendment: With My Rifle By My Side (via joemygod). The title reminds me of similar stories about teddy bears and dolls. With their best buddies, real or imaginary, at their sides, there is no adventure they can’t meet, no task they can’t accomplish. These days, apparently, teddy bears and dolls are just a distraction from what our children are truly called to do. Kids, we are told, need to be taught to defend their country. A man on the train this morning was witnessing for Christ hoarsely and vociferously. It was one of those moments when you curse the express trains out of Queens, because you know you’re stuck with it for a good number of stops. He started out collecting change for a “food program” for the homeless, which was dubious enough. (It’s how to be a Christian, he explained.) But he soon made it worse by lurching headlong into a tirade about Gee-zus. You can be saved, he was telling us. Just say a prayer. He was generous enough to share that prayer with us. I won’t remember the words now, but we’ve heard it before: some combination of biblical quotation and plea for salvation in exchange for eternal allegiance. “A good-looking man like me.” (I can’t confirm how good-looking he was. I was avoiding eye contact.) “I did some terrible things in my life. I did some despicable things in my life. Sold my grandmama down the river for a rock of crack.” (He said “crack” with the same fervent rhetorical emphasis as “Gee-zus” in a way that made me absolutely believe that he was very well acquainted with both, crashing through each consonant and elongating each vowel as if the words were struggling to escape from their sentences.) “But if I can be committed to crack, I can be committed to Christ. If I can be committed to crime, I can be committed to Christ.” And so on and so forth. “Yeah, but ain’t no one dying here right now,” one young woman said to her friend. I have never been much for street preaching and missionaries. It’s sort of a pessimistic approach for a religion to take, if you ask me. No one will believe this unless we convince them by all means necessary. If Jesus is the way, the truth, and the light, these guys apparently have very little confidence that we’ll find him. Have they given up on teaching by example? At the same time, I absolutely respect their convictions and the strength of their faith. I just sometimes wish they’d go get saved somewhere else. But you ride it out until you leave the train or he does. In this case, he backed out the door at Queens Plaza, still preaching his good word, and walked to the local track to transfer. We heard every word until the doors closed and reduced him to a muffled echo. One night a while back, I saw one of these religious experiences turned around in a way I’d never seen before. It was the end of the night for me and my boyfriend, and we were on our way home. We were comfortably lit and a little sleepy on the subway seats, not particularly in the mood for anything remarkable, looking forward to bed. Three women stepped into the train and assumed spots standing directly in front of us. They looked very well put together, if not a little gaudy, like they had just come from a wedding, all long, gleaming fingernails, iridescent lips, bright brown and beige tones across their cheeks, gold and silver synthetic fabrics. One of them had her eyes closed, and she was bobbing her head like she could hear music that the rest of us could not. When it became too much to contain in her head, she began to sing. It was “Amazing Grace,” and yet… it was not. It’s a beautiful song. Or, rather, it can be a beautiful song. But after the first verse, she ad-libbed the rest, singing simply “I love the Lord, I love the lord…” over and over against the same melody. It seemed spontaneous — and unplanned, judging by the uninventive lyrics. Occasionally one of the other women would join or take over the “song,” none of them contributing much but the odd vocal flourish or worshipful gesture of the arm. It must have been past midnight, so I guessed they had just come from some sort of day-long worship service — Methodist or Southern Baptist, by the look of it, if my sense of stereotype is anything to go by — and they were still a little touched by the holy spirit. Unfortunately, very few of the other passengers seemed to be feeling it. I was annoyed by their righteous and presentational self-indulgence. What’s worse, it was all very monotonous. Many people just looked away. Some glared up at the women. A gay couple across the aisle from us were rolling their eyes. I closed my eyes and sighed and hoped it would end, or that at least she would break out of the trance and sing something different. But rather than merely being annoyed, or telling them to shut up as we all wished we could, Jeff looked up and tapped one woman’s arm. “Hey, excuse me. Excuse me. Do you know ‘On Eagles’ Wings’?” he asked. “On Eagles’ Wings” is one of those post-Vatican II hymns from the ’70s. It’s taken from Psalm 91. Everyone raised on Catholic Mass knows it. No, they said, they didn’t. And just like that, they were totally disarmed. Ooh! they said. They did not know it, but they certainly liked it. How does it go? So Jeff sang it again. It was like a walk-off for Jesus. The ladies enthusiastically tried to sing along with him as he stood there with his hands outstretched like a youth minister. All that was missing was a guitar and a tambourine. The gays across the aisle were laughing. Almost everyone in the car had a smile. And we were — what bliss! — approaching our stop. “That boy has the Lord in him!” one of them called out as we stood to leave. “Yes he does,” said another. I had never thought of that before, but I supposed it was true. Jeff had succeeded in undermining their annoyance in their own language and in a way that was not disrespectful. It was brilliant and accidental, an unlikely connection between people very unlikely to cross paths outside of the Great Equalizer, the New York City subway system, and I have rarely been so amazed by him as I was then. I love the way Miss Teen South Carolina cleverly satirizes the dire state of American education by acting like an airhead on TV. She demonstrates her answer to the question in the very way she is answering it. Brilliant. I saw comments on YouTube that defended her, saying she must be under a lot of pressure, and that it is a contest of beauty and not brains. Sorry, kids, but it doesn’t take a whole lot of brains to answer a simple question in Standard English — unless you are part of the problem the question is referring to. I think she should have stopped at “some people don’t have maps.” At least that made sense and was true. I work on the third floor of a little historic building on the Lower East Side. It’s technically a 19th century Federal style row house. What this means is there is no elevator and the building has a lot of character and charm. What this means is it looks like it’s falling apart in some places. But at least I have a nice little office with a door that locks and a front-facing window. What this means is that I can see a parking lot and a tree or two and some old projects. I’m usually thankful that I have a window in the front of the building. I get good light. I get a good breeze. In summer I get the music of the ice cream truck, which is cute for about a minute. I also get the floor-rattling hip-hop bass of passing car stereo systems — and the car alarms that the vibrations set off. So it’s good, but it’s not always good. Lately, on Thursday afternoons, I’ve been hearing a new and wholly more disturbing sound through that window. In the minutes leading up to 5:30, when the neighborhood children are walking home from their after-school programs, someone gets on a microphone with a squeaky sound system and calls out to them to gather round. She lures them with a treat. The first time I started paying attention, it was pudding. She said “pudding” so many times, the word began to sound weird and slightly embarrassing to me. It seemed odd, but I was working late. I assumed it was a legitimate after-school thing. And it was too warm indoors to close the window, so I tried to ignore it. This was back when the Yankees had a chance. And, of course, free pudding. The next week it was pumpkins (with two cans of soda, “for you and a friend!”). The week after that, it was a “candy grab” — apparently, as much candy as the kids could stuff into their arms. Then blow pops. Then another candy grab. Every week, it’s another treat. After the countdown, a male voice and a female shout and yell in a vaguely celebratory way for a bit — “Hey! Yeah! Who wants to play a game! You want to play a game?” — before they separate the boys from the girls. Eventually, I was curious enough to stick my head out the window to see what was going on. I saw a man and two young women bouncing around near the side of the truck facing the building. The side of the van had been folded down to create a sort of stage or platform. Earlier that day I had seen that truck parked in front of the building. It was painted an optimistic shade of yellow with an airbrushed picture of three cartoonish bears in street clothes — they refer to their show as “Yogi Bear” — with the words “Metro Ministries” in bright, cheerful red letters. Ministries. They’re preaching to these kids. With candy. Is it just me, or is this a very cynical approach? Doesn’t the word of God stand on its own? And I can’t help but wonder a few things. Do these kids’ parents know what they’re doing on the way home? Did anyone ever tell them how to deal with strangers who offer them candy out of the side of a parked truck? Does anyone have permission to proselytize to these kids? Do the kids ever care waht they’re being told, or are they just in it for the free stuff? I was in Staples at 34th and Broadway today, waiting for some copies to be made, and I overheard a conversation between a man in his early 20s and a woman in her late 40s about God and biblical literalism. It had been going on for some time by the time I got there. He was standing at the paper cutter cutting 8.5 x 11 copies into eighths. Some kind of cards to hand out advertising an event of some sort. He wore a too-long moustache, an oily ponytail and rollerblades. She stood next to him at the counter doing something with lamination. She had unbound salt and pepper hair down past her shoulders, she wore too much eye makeup, and loose, shabby clothing. At one point he explained that he always had a problem with the Book of Leviticus and its harsh prescriptions against immoral heterosexual behavior and homosexuality. She leaned in. “Well, you know why homosexuality is bad,” she said, lowering her voice to a discreet whisper. “It’s because it’s unclean. It spreads disease. It’s unholy.” She went on, though I had lost interest in the particulars. He gamely pointed out that plenty of heterosexual behavior also spreads disease. They discussed it a bit further. He also drew a distinction between the conviction that adultery being bad because it’s against God’s word and the opinion that adultery being bad because it breaks down bonds of human trust, his opinion being the latter. Eventually they agreed that it was ultimately best to live a life of peace and forgiveness. Bravo. I agreed with her — partially — on something: It was not her place to judge people. But what caught my attention was her hypocrisy. She was passing judgment. I can accept that whoever wrote what is in the Bible is passing judgment. Or, rather, if the words in the Bible are to be taken as the word of God, then what is in the Bible is a representation of God passing judgment. We’re taught that only God can do so and that we must not. OK. I can take that as an axiom of Christianity. But if she says something like “Homosexuality is unclean,” instead of “The Bible says homosexuality is unclean” or “We are taught that homosexuality is unclean” — if she is stating the biblical fact with her own conviction and not attributing the judgment to God, then she’s not expressing an original thought at all — she’s just taking credit for someone else’s work. She’s plagiarising God. And how do you think he would fancy that?